The Single Flower Zen Center exists for public practice and teachings in Zen Buddhism. These teachings are carried on through both formal education and intuitive realization. 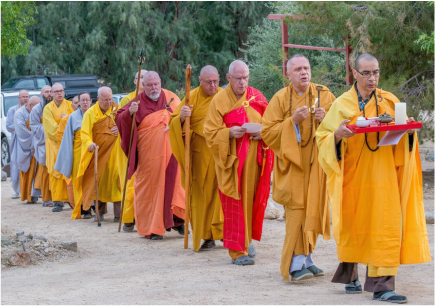 Our Sangha members (roughly equivalent to a "congregation") aspire to save all beings from suffering through developing charity, love, compassion, and awareness in themselves. 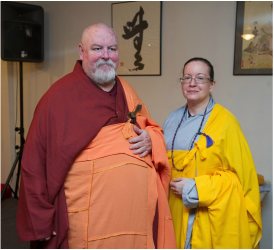 We have no affiliation with other Zen groups or religious denominations other than the Five Mountain Zen Order. However, members of this community are welcome to be part of other groups. Each Zen Teacher within the Five Mountain Zen Order may apply varied practice approaches, as well as use any organizational structure that facilitates practice. Zen Teachers recognize that they are ongoing students, and the value of their teaching derives from the quality of their practice. As continuing students, these Teachers are dedicated to the openness and flexibility of practice, wherein the wisdom of the unconditioned may be manifest in life. A vital constituent of this community is the continuing examination and expansion of instructional approaches. We practice every Monday and Thursday evenings. These weekly practices are offered for a donation. We recommend $10-20 (about what you'd pay for a yoga class), but pay what you can. No one is turned away for lack of funds. After practice on Thursday evenings, we go to dinner together as a Sangha. Like all of our gatherings, this is open to the public. Each month we read a new book on some aspect of the Buddhist tradition. If you've ever been curious about Buddhism but didn't know where to start, this is a very gentle, no pressure introduction to the teachings. We meet for a guided discussion, usually led by Ven. Jabo. Please see the calendar, our Bookclub tab, or Meetup for our current book and meeting place.